I like the way—when I make the prints, when I see different plates come to the paper—I see images in a way that I have never done before. It is a new way of seeing. Color spit bite and sugar lift aquatints with aquatint and soft ground etching. Image size: 26 x 48½"; paper size: 26 x 48½". Edition 50. Image size: 19¼ x 27½"; paper size: 19¼ x 27½". Edition 50. Portfolio of six color aquatints with etching. Image size: 22 x 15½" and 15½ x 22"; paper size: 28½ x 21½" and 21½ x 28½". Edition 30. Image size: 15½ x 22"; paper size: 21½ x 28½". Edition 30. Image size: 22 x 15 1/2"; paper size: 28 1/2 x 21 1/2". Edition 30. Image size: 22 x 15½"; paper size: 28½ x 21½". Edition 30. Jockum Nordström’s work, according to New York Times critic Roberta Smith, “is a more or less truculent crazy quilt of images, styles and events. Past and present are one, and the subconscious is present.” Nordström was born in 1963 in the suburbs of Stockholm, Sweden. He grew up watching his mother sew, and has always been interested in textiles. He has made drawings as long as he can remember. He studied art at Stockholm College of Art and Design, and began showing his work in Sweden in the late eighties. It was not long until Americans found out about him. He was included in a group show at the Jack Hanley Gallery in San Francisco in 1999, and then in 2000 joined the David Zwirner Gallery in New York, where his wife, the painter Karin Mamma Andersson, is also represented. 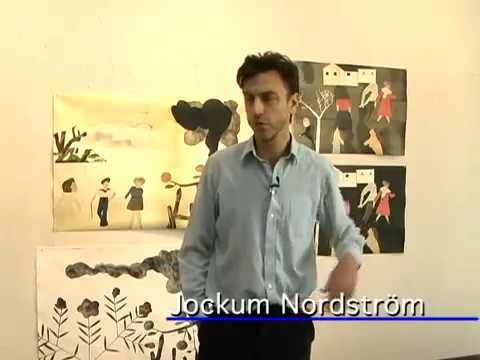 Nordström had a major solo exhibition accompanied by the publication of a catalog at the Moderna Museet in Stockholm in 2005. Nordström is an artistic omnivore. He makes furniture, designs carpets, illustrates children’s books (including the popular Swedish series Sailor and Pekka), designs album covers, constructs architectural models, and makes animated films. When he discovered he was allergic to oil paints, he adopted watercolor, gouache, graphite, and scissors as his primary tools. He builds many images with collage, and is always making new parts (he has a whole drawer of heads) to fill up his compositions. One can feel a restless energy in his collage characters, as if they get out of their drawers in the middle of the night and make up new situations while no one is looking. Nordström’s collage technique adapted easily to the etching process for a 2008 print project at Crown Point Press. Nordström’s work is in the permanent collections of the Museum of Modern Art in New York, the Moderna Museet in Stockholm, and many private collections in Europe and the United States. He is represented by Galleri Magnus Karlsson in Stockholm, and David Zwirner in New York. 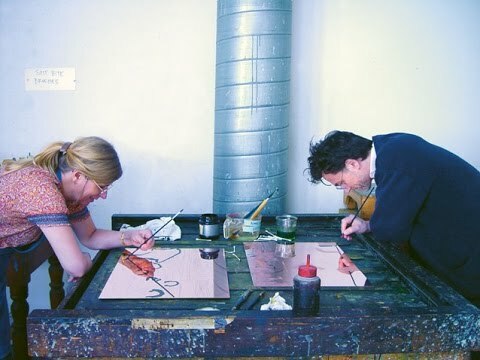 Artist Jockum Nordstrom describes working at Crown Point Press in San Francisco, 2008. Artists Mamma Andersson and Jockum Nordstrom describe working collaboratively at Crown Point Press in San Francisco, 2010.